Anthony Francis 'Tony' Cuccinello (November 8, 1907 – September 21, 1995) was an American professional baseball player who played for five Major League Baseball (MLB) teams from 1930 through 1945: the Cincinnati Reds (1930–31), Brooklyn Dodgers (1933–35), Boston Bees/Braves (1936–40, 1941–43), New York Giants (1940) and Chicago White Sox (1943–45). Cuccinelo batted and threw right-handed. He was the older brother and uncle of former major league players Al Cuccinello and Sam Mele. His surname was pronounced "coo-chi-NELL-oh". A native of Long Island City, New York, Cuccinello led the National League second basemen in assists and double plays three times and hit .300 or better five times, with a career high .315 in 1931. He was selected for MLB's first All-Star Game, played on July 6, 1933 at Comiskey Park, batting as a pinch-hitter for Carl Hubbell in the 9th inning. He also was selected for the 1938 All-Star Game. During the 1945 season, Cuccinello hit .308 for the Chicago White Sox, and just missed winning the American League batting title, one point behind Snuffy Stirnweiss' .309. Nevertheless, he was released in the offseason. In a 15-season career, Cuccinello was a .280 hitter with 94 home runs and 884 RBI in 1704 games. 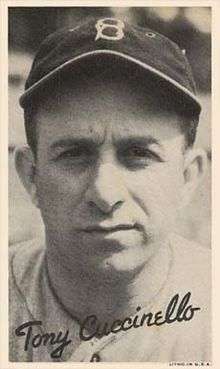 Following his playing retirement, in 1947 Cuccinello managed in the Florida International League for the Tampa team (named the Smokers, after the city's large cigar business), and a year later coached for the Indianapolis Indians of the American Association. He returned to the major league to coach with the Reds (1949–51), Cleveland Indians (1952–56), White Sox (1957–66; 1969) and Detroit Tigers (1967–68). He coached under former teammate Al López in Cleveland and Chicago and was a member of Lopez's 1954 and 1959 American League championship teams, and the 1968 World Series champions. Cuccinello died in Tampa, Florida at the age of 87.